Our Location Biocharproject Australia and Biochar Industries Kunghur. Please contact us to arrange a time to visit. Don’t just turn up! 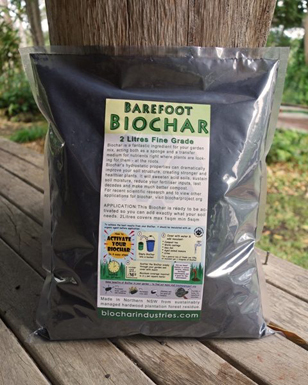 Biochar Industries and the Biochar Project are located in the Mebbin Forrest on the Murwillumbah- Kyogle Road between Murwillumbah, Nimbin and Kyogle, in northern New South Wales, Australia. Take the Pacific Highway from Brisbane or the Gold Coast and after crossing the Tweed River and passing a truck inspection station on the left you will find on the left at the Tweed Valley Way an exit to Murwillumbah. After entering Murwillumbah turn right at the main roundabout where the Murwillumbah Railway Station is on left, and Tourist Information Centre is on right. Cross the bridge over the Tweed River and continue straight through the next 2 roundabouts past the Services Club and Sunnyside Shopping Centre (Coles). Take 2nd left, Riverview Street, to Mt Warning, Uki and Nimbin, which are signposted. A couple of kilometres out of Murwillumbah you pass through Bray Park. Continue on the Kyogle Road and cross the Tweed River again, over a new concrete bridge. Approximately 15 kilometres from Murwillumbah you will pass through the village of Uki. From this point your mobile phone may not work. Continue through Uki heading towards Kyogle for another 11 kilometres and pass a signpost to Doon Doon Road. Travel 2.3km past Doon Doon Rd and see the Kunghur Bushfire Brigade Shed on the right. Travel 1.8km further on with a long white fence on the left side of the road, to a large right hand turn bay opposite Mebbin Springs subdivision. (if you reach the Mt Burrell Caravan Park, you’ve gone too far). Turn Right and follow the gravel road for approx. 50 metres then turn right across the small steel bridge. From here it is exactly 5klm to the biochar project / biochar industries Hq. Stay on the main dirt road and do not turn off until you reach 3klm on your cars speedo or you see right hand Y curve. Turn right and follow the tracks down for 2klm. From the new motorway, take right hand turn lane off the motorway, at the Tweed Valley Way exit just after Brunswick Heads. The road sign indicates Murwillumbah. 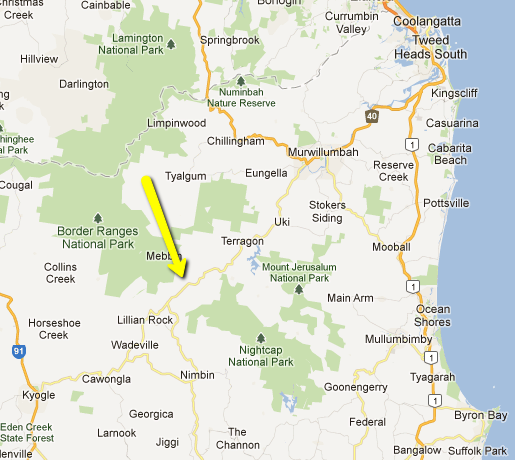 Travel along Tweed Valley Way (Old Pacific Highway) through Mooball and Burringbar and over the Burringbar Range. As you are coming down out of the Burringbar Range approximately 5 km’s north of Burringbar (at the bottom of the hill) turn left at Stokers Siding Pottery sign to Stokers Siding. At Stokers Siding turn left across the Railway Line (Smith’s Creek Road) and continue to the “T” Intersection on the Murwillumbah/Kyogle Road at Uki approx 10klm. Travel 2.3km past Doon Doon Rd and the Kunghur BushFire Brigade Shed on the right. Travel 1.8km further on, to a large right hand turn bay where you’ll see a roadside sign, opposite Mebbin Springs subdivision. Stay on the main dirt road and do not turn off until you reach 3klm on your cars speedo or you see a right hand y curve. Turn right and follow the tracks down for 2klm. From Lismore take the Nimbin Road, proceeding through Nimbin to the T-junction with the Kyogle Rd. Approx 60klm. Turn right into the Murwillumbah-Kyogle Rd and follow the road north past the Mt Burrell General Store and Fruit Stall, and Sphinx Rock Cafe. 2km further on proceed past the Mebbin Homestead on the left, and over a hill. Follow the gravel road for approx. 50 metres then turn right across the small steel bridge. From here it is exactly 5klm to the biochar project / biochar industries Hq. Stay on the main dirt road and do not turn off until you reach 3klm on your cars speedo or you see a right hand Y curve .Turn right and follow the tracks down for 2klm. Phew. With thanks to Interaction Outdoor Education for the directions.